Sunny, few clouds. High 87. Slight wind blowing into LCF. Infield had been worked on during the weekend, so it was level. However, the dirt had a texture similar to flour, making the infield soft and loose. The wind blew around any dirt that was kicked up, producing dust clouds. Had the dirt been sprayed with water, it might not have been that bad. Team built an early lead and then became complacent. B.F. pecked-away and retook the lead. Team tried to rally back, but it was too late. - Offense got off to a good start, but got complacent in the middle of the game. 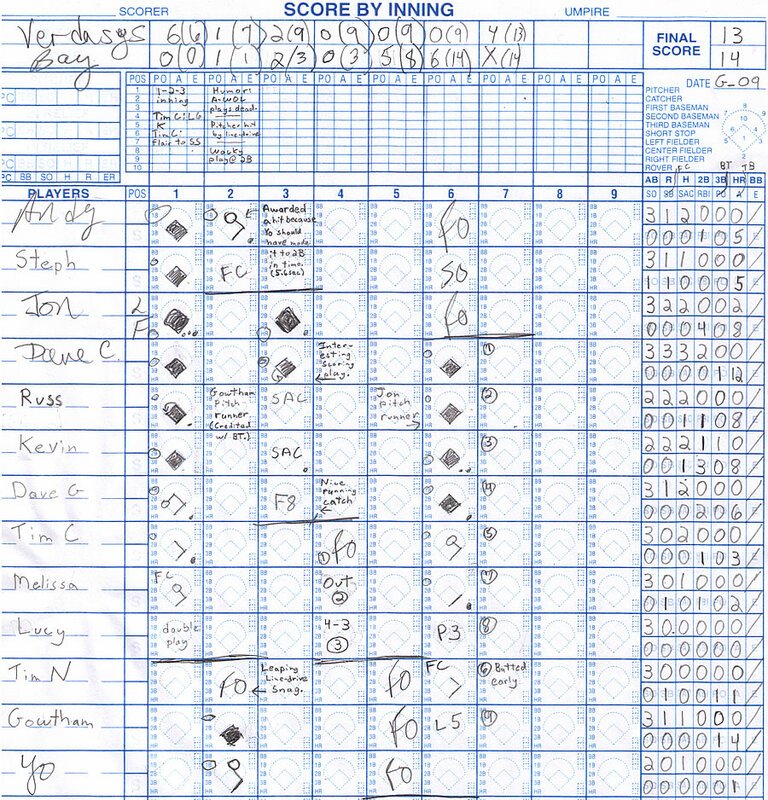 12 batters were retired in a row, which led to 3 quick scoreless innings. Rallied at end of game, but it was not enough to compensate. - Experimented with a "top heavy" batting line-up, where the better hitters were placed towards the top of the line-up. Yielded inconclusive results. - Team was without the following starters: SS Raschi, 1B Spears, OF Cottam, OF Kelley. Placed Godwin at 1B and Cooles at SS. - Overall, defense played great first 4 2/3 innings. Cooles had no trouble with line drives to SS. - McCauley and Cooles had trouble with grounders between SS and 3B, especially one-hop grounders. - Team had trouble fielding balls in the 5th and 6th innings. Not sure why. Could have been more grounders to SS and 3B and hits into the shallow part of CF. A handful of players on the Bay Financial bench exhibited questionable sportsmanship by talking trash throughout the game. (Possibly instigated by a single person of their team.) Apparently, those players had some serious discontent with their losing season and took it out on Verdasys. Of course, their comments toned down when they started winning. Otherwise, their team played hard and became aggressive towards the end of the game. One of their woman players was able to hit the ball into mid CF. - A player was asked NOT to use a baseball bat during the game. Player ignored us and continued to use it, possibly putting players on our team at risk. - Delivering a pitch that is "flat" is NOT illegal. However, such pitches are easier to hit and tend to be tossed at a faster speed. Balls hit from such pitches result in hard line drives, which can be dangerous to the infielders, and the pitcher. Though there is no such requirement in this league, most leagues have a minimum arch height requirement of 6 feet.